Explore either Bartram Trail's rolling elevation through a forest rich with wildflowers, mosses and ferns or Mount Yonah rising from the foothills of Georgia’s Southern Appalachian Mountains followed by wine tasting at local Winerys. Meet us at Andy's Market in Clayton Georgia to start your Journey and exxperience the Bartram Trail, which has been designated as a National Recreation Trail by the National Trail System Act. 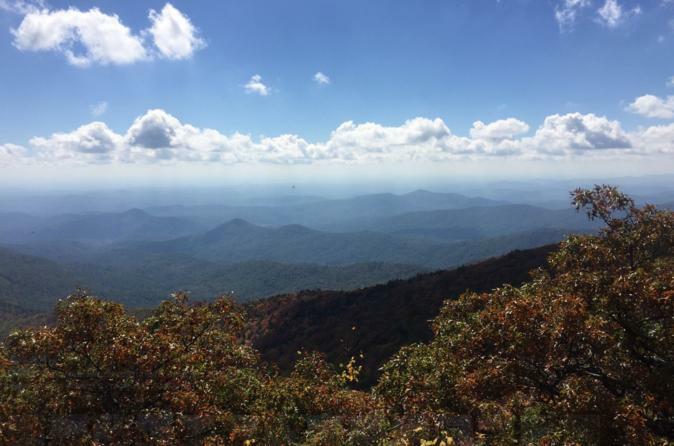 You will trek through Georgia’s scenic Rabun County, which offers a fantastic exploration of northeast Georgia’s ruggedly beautiful wilderness. Yonah Mountain Trail delivers an overall outstanding hike just 90-miles from Atlanta and rises from the foothills of Georgia’s southern Appalachian Mountains. It’s a popular destination for climbers but equally popular with hikers even though it is a difficult and challenging hike. The views are beautiful. Along the way you will enjoy a Picnic style lunch featuring: turkey meat, flat bread, mustard, humus, nuts and berries, and seasonal greens from our organic farm. After our hike you will experience wine tasting at one of three great wineries like Stone Wall Creek Vineyard, 12 Spies Vineyard or Yonah Mountain Winery.